Two secondary schools will merge at a new £18.5m site in Caerphilly county as part of a plan to cut surplus spaces. Oakdale and Pontllanfraith comprehensive schools will shut and a new 900-pupil school will be built, councillors have agreed. As well as cutting surplus spaces, the merger will avoid a backlog of maintenance work at the two schools costing £13.5m. 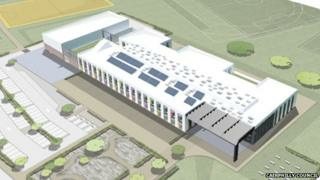 The council said the move would provide modern learning facilities for pupils. The new school will be built at Oakdale Business Park and is expected to open in September 2016. The plans were drawn up after school inspectors Estyn warned the authority it must cut the number of surplus school places, which are expected to rise to 25.8% in the next two years. Some parents were worried GCSE pupils could be disrupted by the move and were also concerned about school transport arrangements. But the council said the response had been largely positive. Cllr Rhianon Passmore, the council's cabinet member for education, said: "The support for this project has been overwhelming, and I'm elated that we're able to take another step forward in this exciting 21st Century Schools project to provide our pupils with modern learning facilities in fit for purpose buildings." The school will be jointly funded by Caerphilly council and the Welsh government under its 21st Century Schools Programme.